Estonia manager Keith Boanas says beating England in Monday's Euro 2017 qualifier would be the "biggest shock in women's football ever". The two sides meet in Tallinn in what will be England's first match since claiming the bronze medal at this summer's World Cup. "It would be a miraculous result for us to take anything from England," Boanas told BBC Sport. Ranked 77th in the world, Estonia are still largely an amateur team. Keith Boanas first moved into management with south London Isthmian League club Tooting & Mitcham in 1998. 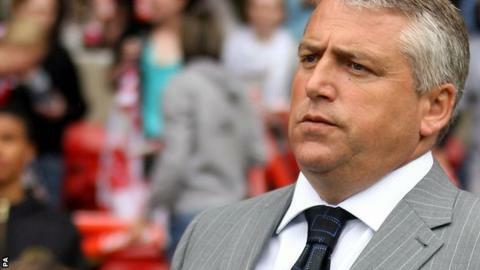 He began combining that role with managing Charlton Ladies in 2000 and concentrated solely on the Charlton job in 2001. Boanas joined Millwall in 2007 and became an international manager with Estonia in 2009. Before facing England, Estonia host Serbia on Thursday night with some players having only been able to report for duty 24 hours before the match because of work commitments. Englishman Boanas says despite only a handful of his players being semi-professional with clubs in France, Finland and Hungary, the female game has improved in the Baltic country since he took over in 2009. "The biggest job I had was to increase participation levels because there were under 500 female players when I first came and now we've just got over the 1000 mark, but it's at least 20 years behind England," he said. Boanas, who is married to former England goalkeeper Pauline Cope, is no stranger to many of the current crop of Lionesses, having managed players including Casey Stoney, Eniola Aluko and Jo Potter during a spell as boss of Charlton Ladies. This is his last international qualifying campaign with Estonia as he intends to leave the post next year, with the hope of returning to the English game. England are 72 places higher in Fifa's rankings, and he acknowledged that the game would be "amazingly tough" for his team. "Will I say to my players before the game we're definitely going to lose, no way, it's not in my make-up to do that," he said. "I don't intent to park a bus to try and limit the scoreline, we're developing and we want to try and play. "But even if we could take something from England, they will still win this group, I'm absolutely confident of that."